From the Star Trek The Next Generation collection by Westland Giftware. Star Trek The Next Generation Captain Picard Ceramic Cookie Jar. This Item is in stock and ready to ship. You should not postpone your purchase and miss out on adding Star Trek The Next Generation Captain Picard Ceramic Cookie Jar to your Star Trek The Next Generation collection! From the Star Trek The Next Generation collection by Westland Giftware. 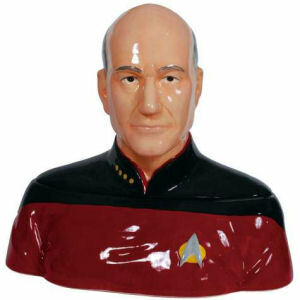 Star Trek The Next Generation Captain Picard Ceramic Cookie Jar. Measures 10 Inches Tall. Hand wash only. Not dishwasher safe. Do not microwave. Westland Giftware Star Trek Cookie Jars shipping from Canada. No Surprise Border fees or Customs!